As writers––heck, as humans––we all have ticks. Habits. It was through writing teachers in my MFA program that my biggest tick of all time became visible to me. My tick is the phrase “I know,” or “I think,” or some synonym of these. One MFA mentor jokingly challenged me to go a week without saying or writing “I know.” Another characterized my poetic stance as tending to be “one of observation” and suggested that it would be good for me to step-inside and explore the full emotional palette I am experiencing. A year or two after finishing my MFA, I stumbled on a personality system called “the Enneagram.” Via the Enneagram, I came to the conclusion that my writing tick makes perfect sense. That doesn’t mean it’s not something for me to watch out for, or to push against. But discovering the connection between my personality type and my tendency to lean on a particular stance leads me to wonder: Do writers of other personality types have particular verbal ticks in common? In the Enneagram system, there are nine types. Type 5 is called “The Observer.” Authors Renee Baron and Elizabeth Wagele assert: “Something an Enneagram Observer type would never be caught dead doing is not saying or thinking ‘I know’ for a week.” I laughed outloud when I read this: How clearly those English professors in my MFA program had seen me. Though, I must say, the fact that I come by my habit naturally––it’s in my hardwiring––is somehow calming. Also, becoming aware gives me a checkpoint from which to consider drafts of poems. Sometimes I go back and try re-playing a poem to see where it might go, launched in a different mode. For me I have to take it to a place underneath words (beyond words), in the murkiness of the body, and then let it come out in new ways. It was interesting to be thinking of something. It was interesting to be thinking. To be thinking. To. It was interesting. It was then she heard the voice the one inside the voice the one she heard. Rachel Galvin’s poem self-consciously embraces a tick and tosses the proverbial rule-book off a bridge. She leans into the habit with neat results. Galvin’s “The Real Thing” is brainy and playful, with surprising intersections. Whether or not the author is an Enneagram “Type 5, Observer,” her poem celebrates a type-5 habit in an energizing and honest way. Three books on the Enneagram that I have enjoyed reading and learning from are The Wisdom of the Enneagram (Don Riso and Russ Hudson); Are You My Type, Am I Yours? 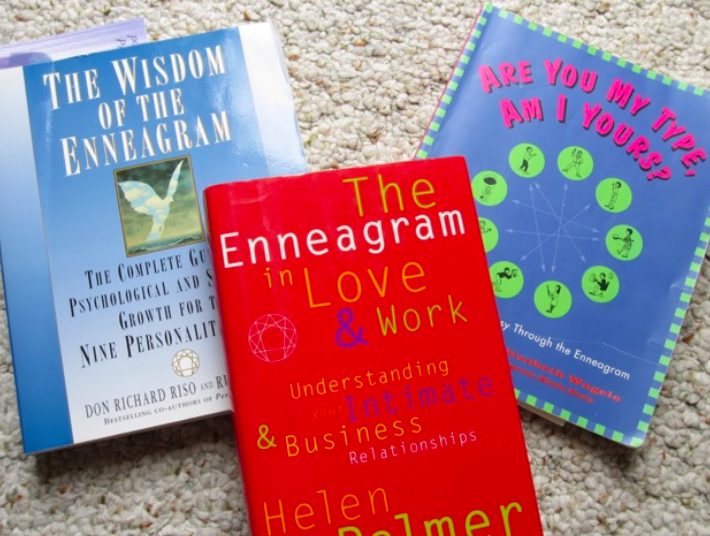 (Renee Baron and Elizabeth Wagele); and The Enneagram in Love and Work (Helen Palmer). If you want to learn about your Enneagram type, there is a free Enneagram quiz at the Enneagram Institute website. Full disclaimer: I have never completed a pay-for Enneagram test, though others swear by these relatively inexpensive, longer versions. A writer I know says: “Live. Then go home and write about it.” He also suggests that because “writing is a lonely career, we should be kind to each other.” I have honestly never thought of writing as lonely. What “live” looks like for each of us might be quite different. (I’m a Type 5, self-preservation-focused being: home and alone is my favorite state.) All the same, to go from an observing stance to an active, in-the-moment stance: sometimes (but only sometimes) I try this in my life, as well as in my writing, and find that experimenting outside my “normal” is worth the stretch.